to peruse our introductory issue of the OPM Quarterly. In September 2015 when I took up office at OPM, I noted that I was surrounded by some wonderful, hardworking people whose knowledge and experience would be of immense benefit to both myself and the Cabinet. I also noted that the key to the optimum running of the Office of the Prime Minister and all our Ministries would be TEAMWORK. Through this publication, we will give you an insight into the work of Team OPM. For many, knowledge about the Office of the Prime Minister may only extend to the fact that the Prime Minister has his office there or the Cabinet meets there once a week and then hosts a Post-Cabinet media conference. 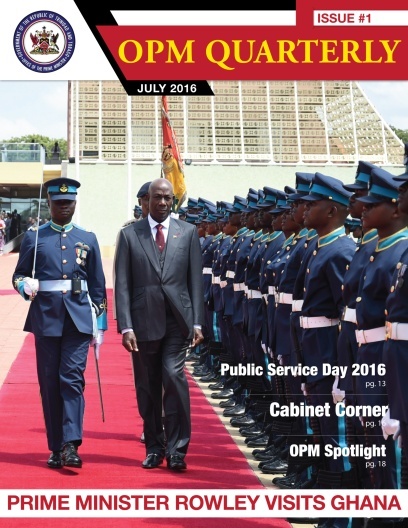 This newsletter will now allow us to better inform you about the full mandate of the OPM, while also sharing information about our staff and the many initiatives being undertaken to ensure that the OPM remains the champion of accountability, transparency and integrity; as we support new governance in Trinidad and Tobago. I extend my thanks and congratulations to our editorial team for putting together this instructive newsletter. We hope that you enjoy our first edition and thank you for taking the time to read this publication.